A wine educator that’s certifiable? 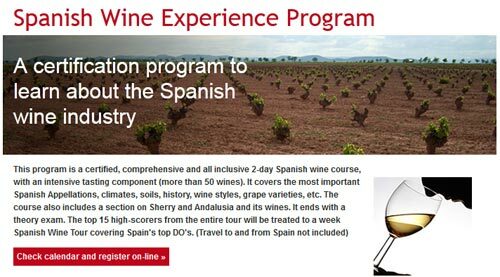 What’s most important to look at in this website is their program which costs nearly 1,000€ for two days after which, those who participate become what they deem to be “Spanish Wine Educators”. While I find it to be extremely expensive, that’s irrelevant as most programs in the certification craze of the last couple of years are all expensive and it appears to be what the market will bear. My bigger issue is in the two day curriculum outlines. If this course was just serving to be a very broad overview of Spanish wine for people to take casually, then, despite the cost, I say to each their own. Though, honestly, I think you could learn a great deal more by just spending a couple of hours reading the Spanish wine and Spanish wine regions articles on Wikipedia, and then going to your local wine store and buy a few bottles to drink at home. But, the fact that those who pass the program feel they’re entitled to then run around calling themselves “Spanish Wine Educators”, and actually believe that they can educate anyone on Spanish wine, is questionable to put it lightly.